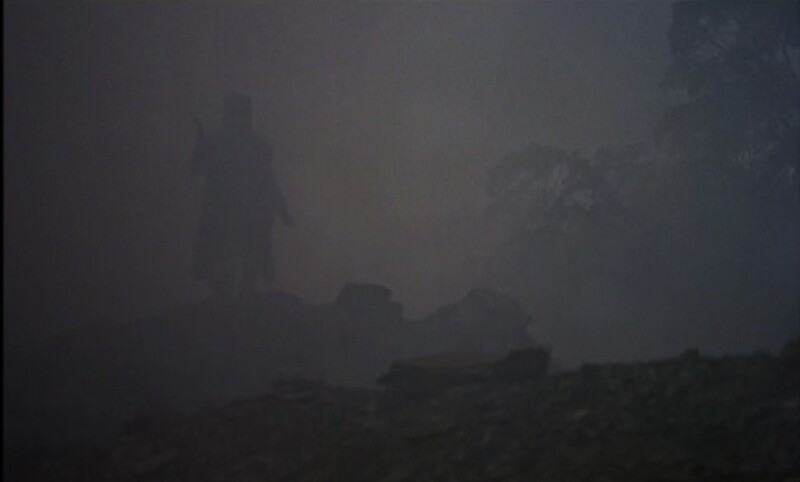 The final shot of Ned Kelly, in which the title character invites his hanging judge to join him in Hell. My love of the Rolling Stones continues to this day, but was at its apex in high school, when several friends and I were nothing short of obsessed with this great band. In those pre-internet days, that meant scouring record-store bins and having endless, wonky discussions about the relative merits of Brian Jones' and Mick Taylor's guitar skills. (Taylor, duh.) We also investigated the extra-Stonesy pursuits of the bandmembers, which is why I still have my old LP of Ronnie Wood's (excellent) solo album, I've Got My Own Album To Do, and which also accounts for my seeking out, in approximately 1989, a VHS copy of the film Ned Kelly. Ned Kelly, made in 1970, was Mick Jagger's film début, so of course high school me had to see it. Though I had generally positive memories of watching it Back In The Day, I recalled very little detail about the movie. When I found a used DVD of Ned Kelly at a recent shelf-clearing sale, I pounced on it. Having just watched it for a second time, I can only assume that, back in high school, I must have seen the world through Stones-colored glasses. Ned Kelly is really not much good at all. The film has a bit of an identity crisis. It wants to be a rousing drama of injustice and nationalism — the kind of thing that benefits from strongly defined characters with strongly defined goals. Yet such strong definitions are lacking in this meandering film, which is rife with "artsy" features such as the complication of temporality and location, a fragmented narrative and motiveless characters. In its quest to be both an art film and a genre film, Ned Kelly loses its way and winds up being a little dull. Even Jagger, whom I regard as a pretty solid actor, didn't bring much to the project. This is a man who (especially in 1969, the year of the film's production) simply oozed Star Power, yet any luminosity he may have possessed was swallowed up by a dopey, Amish-looking neckbeard and his own sincere yet failed attempts to speak in an Irish accent. Mick seems to have been trying so hard to speak in an Irish/Australian brogue that he forgot to do other Acting Stuff. One of the few things about the film that intrigued me this time around was its use of a hallmark device of art cinema: the flashforward. 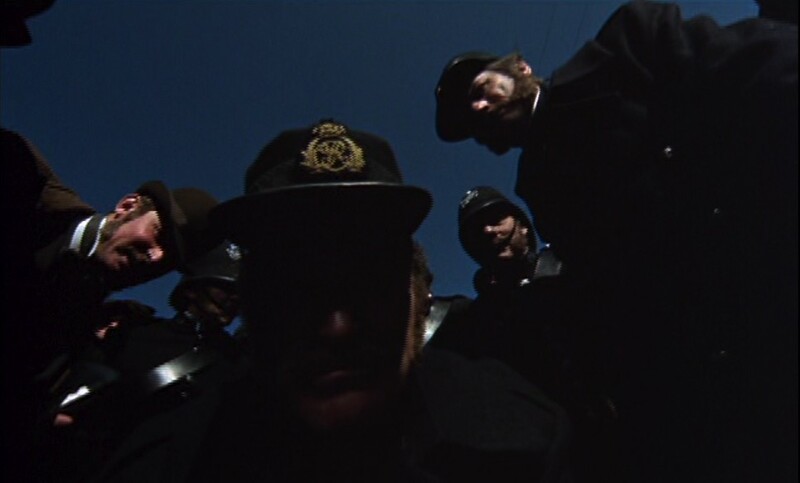 Director Tony Richardson included two brief flashforwards in a single scene in Ned Kelly, and they were, for me, the most interesting moments in the whole film. Flashbacks are commonplace in mainstream cinema. Usually used to indicate memories, dreams or backstory, they briefly disrupt the linear flow of time to take us back to an event in the narrative past. When they're over, we typically rejoin the "main" narrative and have no trouble keeping up, precisely because they're usually so clearly marked as the minor disruptions that they are. Stereotypically, this marking is accomplished by, say, harp music, an image that turns "wavy" and/or a wistful-looking character saying, "I remember when I was a kid..."
Flashforwards, on the other hand, are much less common in mainstream cinema because they are far more disruptive and confusing. By definition, they jump ahead to events that have not yet happened in the course of the main narrative. They are often disorienting, because they refer to events for which we have no contextual clues: neither when nor where nor why the depicted events take place. More than this, flashforwards call attention to the hand of a film's maker in ways that flashbacks do not. By briefly disorienting us in time, space and story, flashforwards often feel like artistic gestures. They don't fill in gaps in backstory, as do flashbacks; rather, they challenge us to figure out what the director is up to. 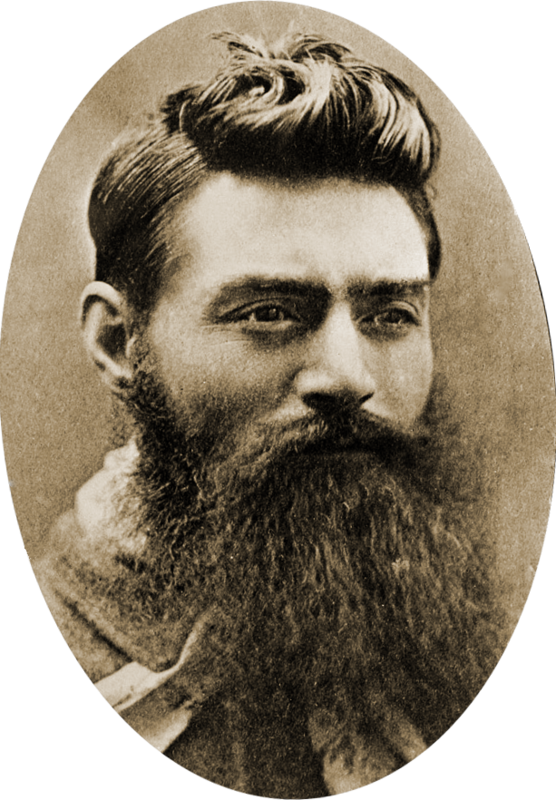 Ned Kelly is about and named for the famous Australian outlaw/folk hero (whose beard, at least according to Wikipedia's photo, was full and properly moustachioed, so I don't know what genius thought that Jagger should look like a scrawny, moustacheless Mennonite.) Kelly is most famous for constructing the suit of iron armor that he wore into a gunfight with police. Both flashforwards occur in a scene where Ned and his band of outlaws are hiding out in the woods, trying to anticipate the next move of the policemen who wish to capture them. They have yet to construct their iron armor. Ned is shown, in a low-light shot, looking pensive; then, without warning and accompanied by the sound of a ricocheting bullet, Richardson cuts to the shot shown below, which stays on the screen for perhaps two and a half seconds. It's a wide-angle close-up of Jagger's face, and the image is so distorted as to render him nearly unrecognizable. Around the top portion of his face is a rectangular frame, also distorted into curvature by the lens choice. Thirty seconds later, interrupting the same scene of languid pensiveness, Richardson offers another flashforward cutaway, this one lasting less than a second. This shot, too, is accompanied by the sound of a gunshot's ricochet. It's a long shot of an unidentifiable figure wearing some sort of helmet and outfit, looking for all the world like the Black Knight from Monty Python and the Holy Grail (which would not even be made for another five years). The second flashforward: Ned, in armor. These two brief flashforwards refer to the "armored gunfight" scene; in so doing, they draw, if slightly and obliquely, on the audience's foreknowledge of the Ned Kelly story. In this regard, they are mildly less disorienting than many an art-film flashforward. (Check out Bernardo Bertolucci's The Spider's Stratagem, also from 1970, for some truly disorienting flashforwards.) Even though these quick shots refer to events that take place after the time depicted in the main narrative, they are not totally incomprehensible. If viewers know or knew any one thing about the actual Ned Kelly, it's that he made that crazy suit of armor and engaged in a shootout while wearing it. With even that tiny amount of foreknowledge, the second flashforward, at least, becomes pretty easy to grasp. It's a quick shot of Ned from that very ironclad gunfight. Its insertion might be explained in a few ways: It startles us into attentiveness during a slow-moving scene; it's a visual depiction of Ned's imaginative idea about how to confront the police; it foreshadows the hero's grim ending. The first flashforward — the one taken with the wide-angle lens — is a little more cryptic, but appears also to be a snippet of the gunfight scene. (The audio clue of the ricochet is crucial here.) The "frame" around Ned's face turns out, in retrospect, to be the eye-slit in his metal helmet; we see his face, up close and distorted, during a moment from the middle of his famous shootout. I'm going to go ahead and call this the film's single best shot, not just because it's so unusual and unexpected, but because it creates unexpected layers of narrative meaning when it's "rhymed" with a shot from later in the film. Despite the armor, Ned loses his gun battle with the police, but does not lose his life. His captors haul him away from the scene of the shootout and into a nearby town; in that later scene, we see the following shot. This shot is taken from the optical point of view of the half-dead Ned as he is dragged through the streets of the town. 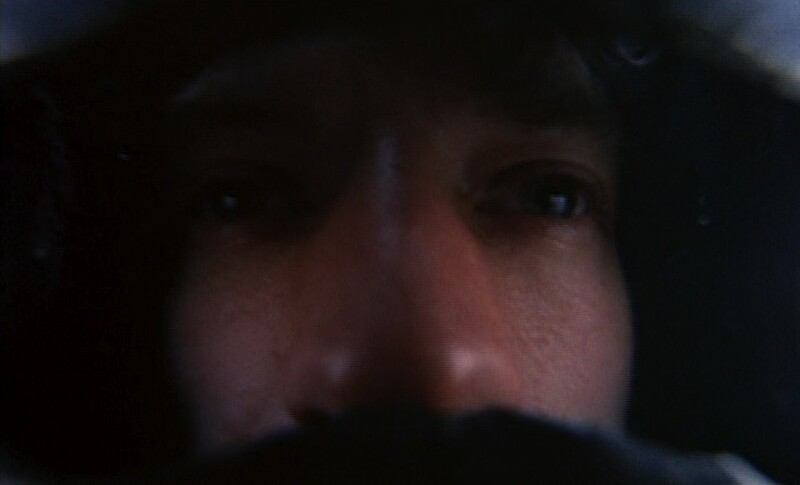 Like the close-up shot of the first flashforward, this shot was taken with a wide-angle lens: Note the parenthesis-like figures on either side of the image. The use of the wide-angle lens links this shot with that first flashforward; few, if any, other shots in the film use so wide a lens. More than that, though, the use of the wide lens in this latter shot imparts somber meaning to the initial flashforward. If we initially take that close-up to be a quick depiction of Ned's unusual strategy, we are now encouraged to read it as a foreshadowing of his demise. The armor seemed like a good idea at the time, but it turned out not to be enough. The shot taken from Ned's POV emphasizes the tragic failure of his unusual idea. The use of the wide-angle lens in these two shots yields a narrative richness that is generally lacking from most of the rest of the film. Would that Richardson had committed more fully to the art-cinema approach implied by his unusual and striking use of flashforwards. As I opine above, the film seems caught halfway between the mainstream narrative mode and the art-cinema mode. These brief flashes of creativity suggest that Ned Kelly would have been enriched had the director embraced the latter.